The first 11 out of an estimated 350 performing street monkeys in the Indonesian capital Jakarta have been confiscated and taken into quarantine, animal rights activists say. Jakarta Governor Joko Widodo said he was acting to save the monkeys and because they were a health risk. His move has been welcomed as "groundbreaking and significant" by the Jakarta Animal Aid Network. Spokeswoman Femke Den Haas told the BBC that it ends years of cruelty. The macaque monkeys are often dressed up and made to perform as street buskers, often attracting large audiences. 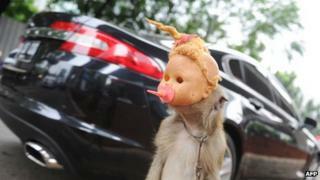 The Jakarta authorities say that they will pay some cash compensation to the owners of the confiscated monkeys. Ms Den Haas said that Tuesday marked the first step in bringing an end to the inhumane treatment meted out to the monkeys. "We have been campaigning since 2009 against the use of street monkeys because they are subjected to a high level of cruelty," she said. "Frequently their teeth are cut out, they are often starved and made to hang upside down for prolonged periods. "They are all traumatised and require at least three months in quarantine before we can even contemplate re-releasing them into the wild - and even then it has to be in an area where there no other wild monkeys." Ms Den Haas said that a group of 40 street monkeys confiscated by the authorities in 2012 were found to be carrying various diseases including tuberculosis, hepatitis and the bacterial disease, leptospirosis. She said that the monkeys' handlers were invariably street children who were often exploited or coerced into becoming their handlers. "The monkeys live in pitiful conditions, are riddled with parasites and forced to live in small cages," she said. The Jakarta authorities initially intended that the monkey confiscations would begin in 2014 but they say that they were forced to act earlier because of the appalling conditions in which they are made to live. "That is related to order on the streets as well as rabies and other sorts of diseases, that is why we want to be free of performing monkeys and why we have started this week," Mr Widodo told local media on Monday. Posters promoting the campaign have been displayed across Jakarta as part of efforts to raise awareness of the issue. Mr Widodo said the city government would place the confiscated monkeys under the control of the Jakarta Marine and Agriculture Office while their owners were trained to learn new skills for other jobs. "We will think about them later, especially keeping in mind that most of the owners are not residents of Jakarta," he said. "The exploitation of monkeys for performances has become an international issue and the city administration will act immediately to save them."